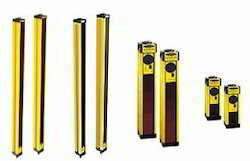 We bring forth a comprehensive range of Safety Light Curtains. This simple, two-piece integrated system has no control box, High-resolution 14 and 30 mm point-of-operation systems detects fingers, hands and ankles, Type 2 models with 30 mm resolution are available for lower-risk applications, Point and Grid systems allow one-, two-, three- or four-beam perimeter and access guarding, Superior optical design and finely focused ±2.5° beam make systems extremely easy to align and maintain, Status indicators and diagnostics show when alignment is complete and installation is correct, Redundant microprocessor-controlled, self-checking design of Type 4 models exceed control reliability requirements and is certified per CE (Type 4/Category 4) and cULus (NIPF, UL 61496, UL1998), Unique cascading models allow up to four systems of any length and resolution to be wired together to form a single safety device Systems have ranges up to 70 m, with power and range for all types of applications including long-range perimeter guarding, Compact, rugged and lightweight housing resists impact, twisting and abusive environments. We bring forth a comprehensive range of EZ-Screen Low-Profile Safety Light Curtain Systems. 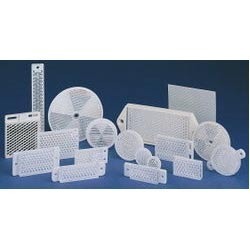 The compact profile and multiple mounting options make EZ-Screen LP Safety Light Screens a perfect fit for a wide range of machine safety applications, Exceeds OSHA/ANSI Control Reliability requirements, certified to cULus NIPF, and CE certified to Type 4, Category 4PLe and SIL 3, Available in nickel-plated housings for ESD-safe applications, clear anodized aluminum housing or "safety" yellow powder-coat housing, 14 mm or 25 mm resolution; defined areas from 270 to 1810 mm (10.6″ to 71.2″), Positions first and last beam at the ends for continuous sensing; included side-mount brackets allow no "dead" zone, Provides response times as fast as 8 milliseconds with detection ranges up to 7 m.
Our company is engaged in offering a comprehensive range of Mini- Screen Safety Light Screen Systems. The family is designed for heavy-duty production machinery, Full system includes emitter, receiver, controller and interconnecting cables, Standard or heavy-duty housing is available for emitters and receivers, Emitters and receivers feature compact housing with 19, 25 and 38 mm resolution, Controllers are available with dc or ac supply voltage, Metal box and DIN-module controllers are available, Systems include floating blanking (one- or two- beam), selectable auto power-up and optional fixed blanking. Our company is engaged in offering a comprehensive range of AG4 Series Safety Laser Scanners. These are very flexible – protective and warning fields can take nearly any shape, Capable of switching “on-the-fly” between eight pre-configured field pairs, Adjustable response time (80 ms to 640 ms), Selectable resolutions 30mm, 40mm, 50mm, 70mm, 150mm, Two models available: AG4-4E with a maximum 4 meter range, AG4-6E with a maximum 6.25 m range, Cost effective for difficult safeguarding solutions, Interfacing options include: SC22-3/-3E Safety Controller, UM-FA-9A/-11A Universal Input Safety Module, MMD-TA-11A-12B Dual Controller Muting Module, Compact design, simple installation and easy-to-use software provide efficient integration into work zones, Rugged, die-cast aluminum housing withstands the rigor of factory floors. 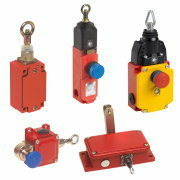 Our company is engaged in offering a comprehensive range of Locking Style Electronic Limit Switches. Switches lock a mechanical guard until hazardous motion stops completely, Two housing styles are available, based on voltage, Two locking mechanisms are available—spring lock with energized solenoid release and energized solenoid lock with spring release, A wide range of solenoid voltages are available, Rotating head requires little or no tools to adjust to one of four positions, Rigid and flexible in-line actuators are available and Design meets positive opening requirements for safety interlocks. Family is designed for heavy-duty production machinery. Full system includes emitter, receiver, controller and interconnecting cables. 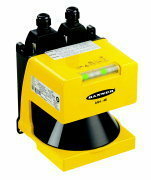 Standard or heavy-duty housing is available for emitters and receivers. Emitters and receivers feature compact housing with 19, 25 and 38 mm resolution. 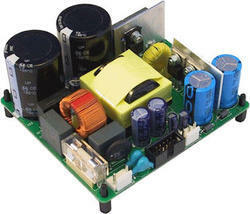 Controllers are available with dc or ac supply voltage. Metal box and DIN-module controllers are available. 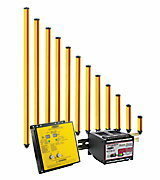 Systems include floating blanking (one- or two- beam), selectable auto power-up and optional fixed blanking. 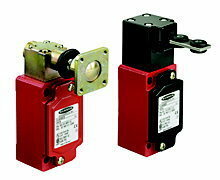 SI-LM40MKH models are available with rigid and flexible in-line actuators. SI-LM40MKV models have a trumpet-style actuator. Rotating head requires little or no tools to adjust to four positions. Three types are available—load-bearing hinge, hinged lever and rotating hinge. Safety switching point can be set anywhere within 0-180° operating range on some styles. 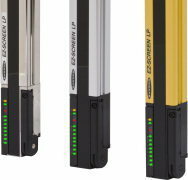 One-piece switch eliminates need for alignment, engagement and risk of breakage of a separate actuator. Two housing styles are available, based on voltage. Two locking mechanisms are available—spring lock with energized solenoid release and energized solenoid lock with spring release. 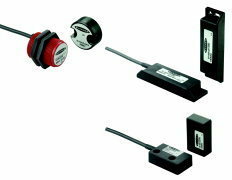 A wide range of solenoid voltages are available. Rotating head requires little or no tools to adjust to one of four positions. Available spans range from 6 to 100 m.
Minimum switch life is 1 million operations. Our company is engaged in offering a comprehensive range of Hinge Style Safety Interlock Switches. 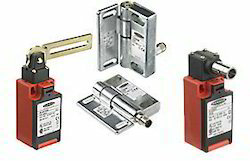 Three types are available—load-bearing hinge, hinged lever and rotating hinge, Safety switching point can be set anywhere within 0-180° operating range on some styles, One-piece switch eliminates need for alignment, engagement and risk of breakage of a separate actuator and Design meets positive opening requirements for safety interlocks. 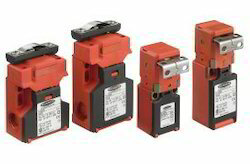 We bring forth a comprehensive range of SI-MAG Series Magnet Style Switches. The sealed components resist water, dirt and are more accommodating to misalignment than mechanical switches, Compact size makes it possible to conceal the switch, Three housing styles are available for flat or 30 mm barrel-style mounting, All models provide one normally open (NO) and one normally closed (NC) actuator contact, Shifts in distance and alignment don't compromise sensing, Coded magnets minimize the risk of intentional defeat, Magnets with different polarizations add security, For safety applications, switch must be used with gate monitoring module GM-FA-10J (or approved equivalent). We bring forth a comprehensive range of Compact Metal Style Safety Interlock Switches. Mechanically coded actuators use two independent operating elements to minimize intentional tampering or defeat, Compact metal style switches are designed for limited space requirements in rugged environments, SI-LM40MKH models are available with rigid and flexible in-line actuators, SI-LM40MKV models have a trumpet-style actuator, Rotating head requires little or no tools to adjust to four positions, Design meets positive opening requirements for safety interlocks. 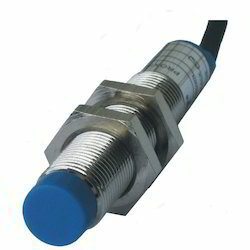 Sealed components resist water, dirt and are more accommodating to misalignment than mechanical switches. Compact size makes it possible to conceal the switch. Three housing styles are available for flat or 30 mm barrel-style mounting. All models provide one normally open (NO) and one normally closed (NC) actuator contact. Shifts in distance and alignment don't compromise sensing. Coded magnets minimize the risk of intentional defeat. Magnets with different polarizations add security. For safety applications, switch must be used with gate monitoring module GM-FA-10J (or approved equivalent). We bring forth a comprehensive range of Compact Plastic Style Safety Interlock Switches. 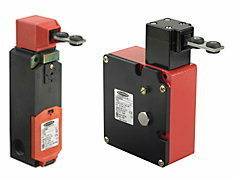 The Mechanically coded actuators use two independent operating elements to minimize intentional tampering or defeat, both housing styles are available in two sizes offering different contact configurations, Rotating head and top or side engagement allows for eight different actuator positions, Four standard actuators are available, as well as an optional high-extraction-force actuator, Design meets positive opening requirements for safety interlocks, IEC IP65 switch housing rating increases to IEC IP67 with addition of a screw to the wiring chamber door. Broad offering of bracket styles makes it easy to install sensors vertically, horizontally or diagonally. Swivel brackets offer greater range of motion. 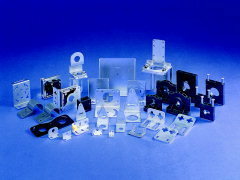 Adapter brackets provide mounting flexibility. Retrofit brackets enable you use existing mounting holes when installing a different emitter/receiver. Replacement brackets are available for brackets included with emitters/receivers. 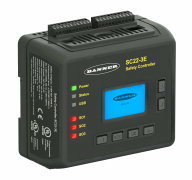 Looking for Machine Safety Switches & Scanners ?